Italy won the Schneider Cup races in 1920 and 192I and was thus named as the organizer, under the rules, of the 1922 race. 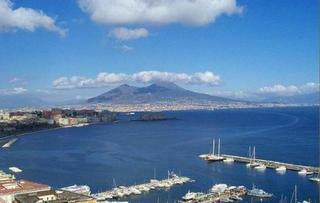 It was decided to hold the race in Naples. Italian fans hoped to see Italy retire, with a third victory -- and with the proved high speed performance of the Macchi flying boats -- the flashy trophy put into play nine years earlier by Jacques Schneider. 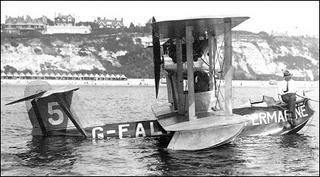 Henry Biard and his little Supermarine flying boat. The Italian Macchi racers were suddenly seen to be obsolete -- last year's winners. "Actually the Naples race was a lesson for us," wrote in 1927 the Italian aeronautical journalist Jotti Da Badia Polesine, "We had (simply) continued in the footsteps traced in previous years, while the technicians in England, who understood the priorities and the true essence of the Schneider race, came down (to Naples) prepared to win."